Newcastle-upon-Tyne, Durham, Sunderland, Chester-le-Street, Middlesbrough, Stockton-on-Tees, Darlington, Thirsk, Northallerton, Richmond, North Yorkshire, Barnard Castle, Bishop Auckland. The British textiles industry is turning the corner Up North. After years of cross roads and wrong turns we are emerging into a brighter future. This conference will present the industry as it is today and address both its achievements and ongoing challenges. With an unrivalled breadth of speakers the conference has a positive, forward thinking approach. Not only will we consider the industries position domestically but also looking internationally and, crucially, consider how British companies can expand and grow into international markets. That said the conference is not about “pie in the sky” thinking but rather is focused on real world experience where challenges have been overcome and new business won. Our speakers are senior level industry leaders and believe in the great strength of the British textile industry…especially Up North! Speakers include: Alice Blackie – 26 – Managing Director – Pink Boutique Pink Boutique was started 3 years ago from Alice’s living room. The business, which sells glam fashion, operates solely online and had a turnover last year of 6 million, targeting 300% growth for this year. The operation runs from a 30,000 sq ft warehouse in Newcastle upon Tyne with 55 staff.. http://http://www.pinkboutique.co.uk Andrew Brown – Group Managing Director – Fast React Systems Fast React are a global provider of supply chain solutions specifically for the fashion industry. The Fast React team is made up of people from textiles, apparel, footwear and garment backgrounds, which is how they have developed systems which meet the exact needs of the industry. Global fashion brands, well-known high street retailers and worldwide manufacturers all use Fast React’s products to improve visibility, coordination and control. You can find Fast React in the UK, Thailand, China, Bangladesh, Sri Lanka, Korea, Germany, Russia, Portugal, India, Indonesia and South Africa. As Managing Director, Andrew has overseen the strategic global growth of the company. His extensive knowledge of manufacturing and sourcing operations also enables him to play a hands-on role within the business he truly believes offers cutting-edge solutions to help the fashion industry and its supply chain to remain flexible, responsive and profitable http://www.fastreact.com/ Jenny Holloway – CEO – Fashion Capital Jenny Holloway has been working in the fashion industry for over twenty five years mostly in the private sector. Initially she was a buyer for Littlewoods, M&S and Principles for Women before opening her own label Retro. For almost ten years Jenny was Director of her successful business Retro UK Ltd which included retail boutiques, party plan, wholesaling to major retailers such as John Lewis, Principles and independents. Retro UK also had an excellent export business with key accounts in the Middle East and Europe . http://www.fashioncapital.co.uk/ John Miln – CEO – UKFT UK Fashion & Textile Association is the most inclusive British network for fashion and textile companies. It is the voice and meeting place for suppliers of fashion and textiles. John Miln serves as the CEO and Company Secretary of UKFT. He is chairman and non executive director of various industry trade bodies and has been deputy chairman and treasurer of the UK Fashion & Textiles Association. http://www.ukft.org/ David Reay – CEO – David Reay Associates David Reay brings over 30 years of business experience in helping global fashion brands boost productivity and grow profits across the UK, Europe and the United States. Now operating independently, David’s past roles include Director of Manufacturing & Sourcing at Barbour, European Operations Director at Jockey, Senior Vice President Operations at Authentic Fitness (Warnaco) along with senior roles at Dewhirst Menswear, Claremont Garments, Bentwood Limited and J & J Fashions. http://www.davidreayassociates.co.uk/ Conference & Venue Information The delegate rate includes a lunch buffet and refreshments throughout the afternoon. Free car parking is provided at the venue which is located just off the M66. WordPress 4.2 “Powell” – YouTube. The latest WordPress 4.2 “Powell” – YouTube version explained. The updates are mainly how to share information from the Internet via your WordPress blog/platform/website. Google Search, Internet Marketing, Google Search Engine. Part of your Internet marketing should be to achieve top ranking in Google. In the Google Search Engine Results Page (SERP). May ways to do it: You can ‘Pay Per Click’ Google AdWords, add your site to ‘Google Local’ business directory. This gives you a business listing that appears locally. For a chance to be listed near the top of a search page on Google you have to optimise your website for organic searches. It had become more complex to achieve a high ranking in Google organic search result. Google has evolved and tightened up its algorithms making it harder to achieve a placement / high ranking for your key words / phrases. Especially when you are in a competitive market, Who isn’t? 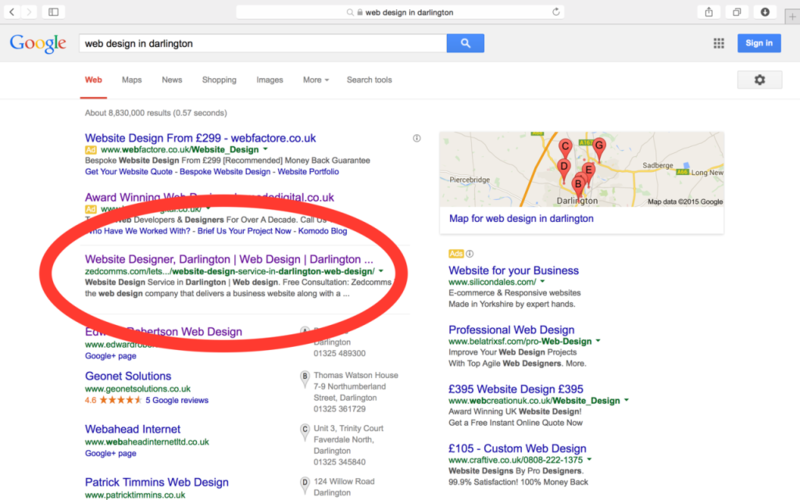 So, searching for a ‘Web designer Darlington’ will be competitive. 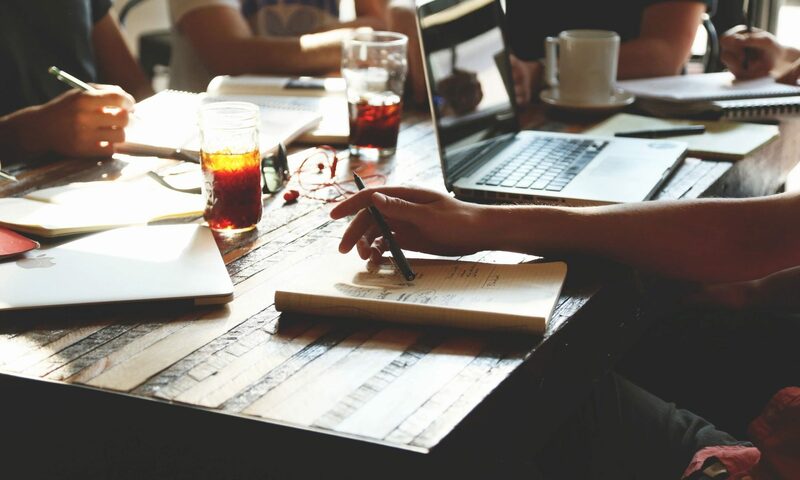 In Darlington there are lots of digital agencies, website designers, marketing agencies etc who serve Darlington with this type of service, indeed all towns in the world will have a similar competitive circle. Make sure the KEYWORDS are in the TITLE. Make sure the page content is at least 300 characters. Link out and look to link in to the page. Test your sites speed to load. It needs to be less than 0.24 second. Build inbound links to your site. For example Social media and forums are good. Submit a site map to Google Webmaster Tools. Count the keyword density in your pages. Try and get to .75 – 1.0%. Well, Zedcomms are placed #1 in the organic search result for this phrase. And guess what? We’re not even in Darlington! For website design and marketing support let us know. We offer a free consultation with a bespoke report to show you what can be done to support your marketing and website design.